Watch children's faces light up with excitement as the Foam Party Fun B arrel-train arrives and announces......."All Aboard"!!!! 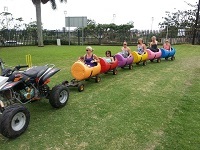 The Barrel-train is a set of 6 multi-coloured barrel coaches and is pulled along by the Foam Party Fun 4 wheeler. 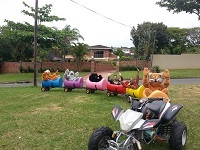 What makes our barrel train special is that there are no tracks (which only go round and round) and the train can go "site seeing" with its little passengers (within the venue borders). For corporate and private hire, we will deliver the Barrel-train to your venue, hook up the coaches and leave a driver to drive the children around.